President Obama focused blame on Republican responsibility for refusing to raise the ceiling on irresponsible spending. 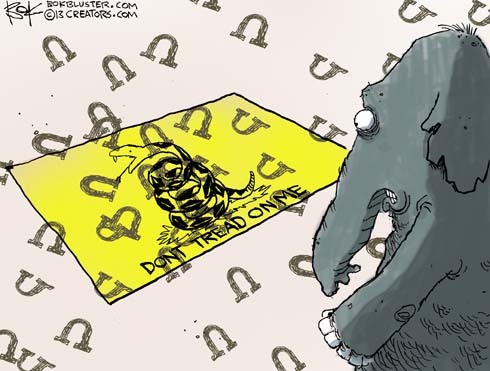 The Tea Party made a brave stand but in the end got stomped. I like cartoons that work without words – other than the ones on the flag in this case. Also, I think it’s funnier when a cartoon implies an event that has already happened and the reader gets the punchline when he or she recognizes it.